Posted on Tuesday, July 1st, 2014 at 8:00 pm. TaiwaneseAmerican.org has partnered up with Oakland Asian Cultural Center and other San Francisco Bay Area API organizations to collect submissions for the OACC inaugural zine to celebrate Asian & Pacific Islander artists’ work, to capture the wide range of work produced by the API community, and to create a space for artists to connect with one another. The theme of the zine is “I Am Here” building off of the Smithsonian Asian Pacific American Center’s Asian Pacific American Heritage Month (APAHM) 2014 theme of “I Am Beyond.” The zine will be distributed to local nonprofits and at various community events mostly within the Bay Area’s API community. Let’s make sure Taiwanese Americans are represented! All entries by people who identify as Asian/Pacific Islander will be considered. Entries can encompass genres like poetry, graphic design, prose, paintings/drawings, cooking recipes, etc. 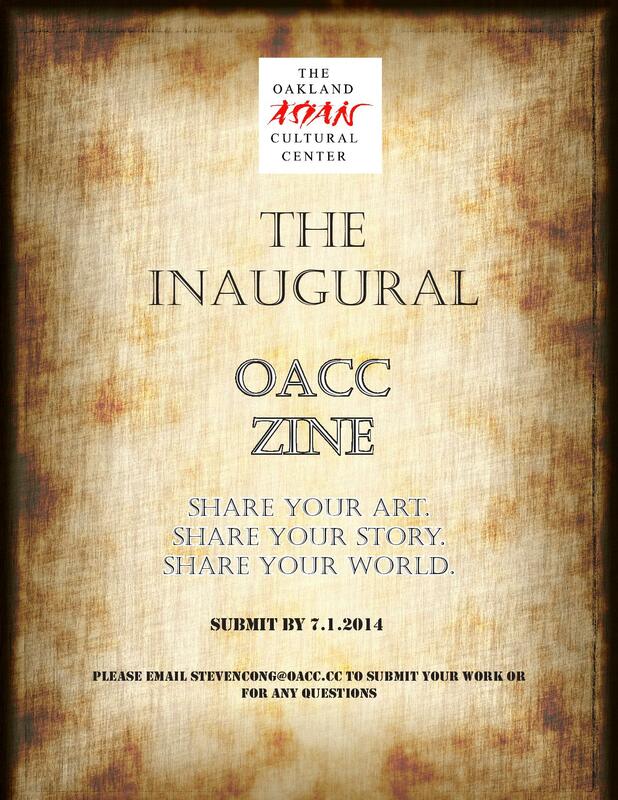 The deadline to submit is Tuesday, 7/1/14. If you are interested in submitting, we also ask that you send us a 150 word or less bio with a high-resolution head shot of yourself. If you are submitting a poem, we ask that it be 20 lines or less. You can feel free to share 20 lines from poems that are longer. If you are sharing from a song, we ask that you limit it to one verse from your song if the song is longer than 16 bars. If you are submitting a prose piece, we ask that it be 200 words or less. All photos and all pictures of paintings or drawings should be no less than 5 megabytes in size. All submissions, bios, and head shots can be sent to at [email protected] (also cc [email protected] in your email). Feel free to also email [email protected] with any questions that you may have.